Loyce A. Wooff founded Wooff Real Estate in 1942 on the principles of honesty, integrity and loyalty. 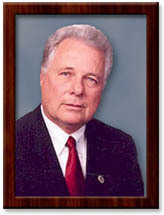 He received Realtor Emeritus and an Honorary Lifetime Membership from the National Association of Realtors in 1994. Many things have changed over the course of the past 75+ years, but not our way of doing business. “Honesty, Integrity, and Loyalty in Service” continues as Wooff Realtors’ company motto to this day. Dennis Wooff, the owner of Wooff, Inc., has been serving the Riverbend area for over 45 years. He prides himself on training an excellent staff that will be able to handle all of the details of the real estate transaction. From buying to selling, the agents of Wooff, Inc. will be there to help you every step of the way. In our continued efforts to provide quality service to our clients and customers in the St. Louis Metro East Illinois area, as well as those looking to relocate here, we have created this Web site as a place where you can find information that will help you make an informed decision on your real estate needs. If you can’t find the information you’re looking for, please don’t hesitate to contact one of our offices or any of our agents. If you are Military , please see our special section HERE. Send questions or comments by email to: aflach@wooffrealtors.com. We currently have offices in regional locations: Alton and Fairview Heights, Illinois. Our agents are trained professionals who know the local market and can help you with ALL of your real estate needs! We are knowledgeable about the markets in the following areas, as well: Godfrey, Collinsville, Maryville, Glen Carbon, Troy, Brighton, Belleville, Swansea, Wood River, O’Fallon, Waterloo, Shiloh, Jersyville and Columbia. With Shawna’s help, we had a contract on our house 6 days after it went on the market. She also helped my husband and I negotiate with a very difficult seller and we were able to purchase our dream home. I recommend Shawna and Wooff Realtors to all of my friends and family. Ben S.
Jeff & Shawna -I appreciate all of the help that you provided to me and the purchasers. You really went far above what one expects from a realtor. I will never forget your kindness and always recommend you as the BEST realtors ever! God Bless. Vicki G.
We would like to thank Jeff and Shawna for selling our house so quickly. We had it on the market for 6 months (with another Realtor) and didn’t know why it wasn’t selling. They identified the problem quickly and we were able to resolve the problem. They were very professional, gave attention to detail and treated our home with respect. They were always available when we had questions and were there when we need them. We really felt like they were on our side. Thanks (Jyn) for all your help. Couldn’t have done it without you. I am very happy and I’ll tell all my friends. Excellent staff cooperation and marketing of my house. could not have worked with a more qualified realtor (Amy) who executed the sale flawlessly. tri-level homes are not easy to sell since there is no real basement as a traditional home. storage area is limited. you need to find the right buyer. I thank you for all the time and work you did for me…..you are simply the best! Wooff Realtors, Inc. © 2019. All Rights Reserved. Built in St. Louis by Clicked Studios Web Design Company.